Aqua Vista Hotels is supporting the 1st Nafplio Tourism School, a two-day training seminar focused on tourism and catering that aims to upgrade the Argolida region’s tourism product. Organized by the Municipality of Nafplio, the 1st Nafplio Tourism School will take place May 18-19 at the Fougaro cultural centre. George Tsolakakis, Aqua Vista’s co-owner and sales director, will join the speaker line up and provide insight on “The Art of Luxury Hospitality”. The aim of the Nafplio Tourism School seminar is to give tourism professionals, employees and students, ongoing training and updated information on issues regarding the tourism and catering sectors in order for them to consistently follow new developments in a constantly changing work environment. Speakers of the two-day seminar include Professor Dimitrios Buhalis, strategist and eTourism innovator, who will discuss the new trends in tourism; Barbara Avdis, chairman of the Historic Hotels of Europe, who will discuss branding; Lia Zabetoglou, education director of INSETE, who will talk about connecting tourism with its people; Maria Papazoglou, head of PR company My Publics, who will give insight on how to do PR for a company during a crisis period; and Yiorgos Pittas, Hellenic Chamber of Hotels member and supervisor of “Greek Breakfast” hotel program, who will talk about the treasures of Greek gastronomy. 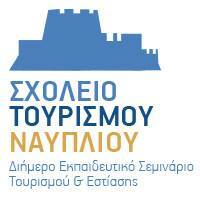 Further information on the 1st Nafplio Tourism School can be found here.